Emory's quartet in residence, the Vega String Quartet, will make its debut at the famed Musikverein in Vienna on Saturday, Nov. 21. The quartet performs free concerts on campus on Oct. 16 and Nov. 6. The 2015-16 season marks the final year of fundraising to permanently endow the Vega String Quartet's residency at Emory and to help keep them in Atlanta. "The Katz Foundation made an extraordinary $1 million matching challenge grant towards this, and we now have over $800,000 in the bank towards that," explains Will Ransom, director of the Emory Chamber Music Society of Atlanta. The concert in Vienna at the Musikverein on Nov. 20 and another one on Nov. 19 in Berlin "will further demonstrate the power of world-class music to promote the excellence and visibility that Emory strives towards, and will encourage more people inside and outside the university to support their groundbreaking residency," he says. Emory's quartet in residence, the Vega String Quartet, will make its debut at the famed Musikverein in Vienna on Saturday, Nov. 21. "The Musikverein in Vienna is the Carnegie Hall of Europe," says Will Ransom, director of Emory Chamber Music Society of Atlanta, "so only the finest in the world get a chance to perform there." Another honor for the Vega and Ransom is an invitation to perform at the residence of the U.S. Ambassador to Austria, Alexa Wesner, on Tuesday, Nov. 24, and to join her for a Thanksgiving dinner after. 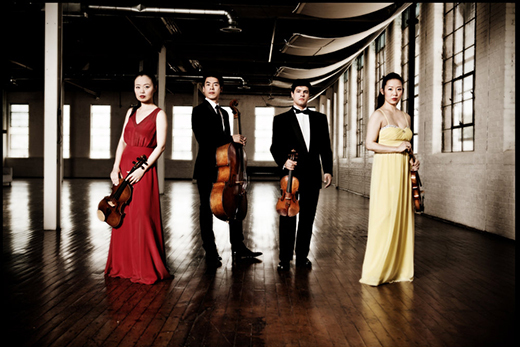 The Vega is composed of Yinzi Kong, violist; Domenic Salerni, first violin; Jessica Shuang Wu, second violin; and Guang Wang, cello. Their next concert on the Emory campus is set for Friday, Oct. 16, as part of the Cooke Noontime Concert series. The free performance, which takes place in the Matheson Reading Room of Candler Library, will also feature readings from poet T.S. Eliot's "Four Quartets" by Eliot expert Ronald Schuchard, Goodrich C. White Professor of English Emeritus. Although the four musicians are the quartet in residence at Emory and teach throughout the university, they continue to tour internationally, record and commission new works from composers. "They are carrying Emory's name as a beacon for excellence far and wide around the world," says Ransom, who is also Mary Emerson Professor of Piano and director of piano studies at Emory. The Vienna concert is a milestone for the group. "As one of the major concert venues in the world, all the top musicians in the world are constantly performing there. But even for the most seasoned and popular performers, a concert at the Musikverein anytime is special," he adds. The opportunity came about because, Ransom says, "We were planning a European concert tour to France, Belgium and Italy, and our wonderful patrons of music at Emory, Dr. John and Linda Cooke, wanted to know if it might be possible for the Vega to play at the Musikverein. A manager in Berlin asked to hear a CD of the Vega and to see their resume. He then offered to present them in these two debut concerts, and with generous help for the travel costs from the Cookes, we were able to put this together." The Vega String Quartet has selected a diverse program to perform for the Musikverein audience. "We wanted a program that would showcase the Vega at their best in the classics while also including some newer music that would reflect the Quartet's heritage and also be of extra interest to the musical elite," Ransom says. They will open with Beethoven's Quartet in F Minor Op. 95 and then perform two newer works: "Song of the Ch'in" by Chinese composer Zhou Long, followed by composer David Garner's "i ain't broke, but i'm badly bent: 13 fiddle tunes for string quartet." Garner is from Atlanta. "These brilliant renderings of country fiddle tunes in a modern classical style reflect where the quartet is currently based — the American South," Ransom says, noting that this will also be the Viennese premiere of this work. The second half of the program begins with Hugo Wolf's "Italian Serenade," reflecting the heritage of Salerni, and they finish with another classic, Mendelssohn's Quartet in E Minor. Emory will host a reception at the Musikverein after the concert for Emory friends and alumni. The quartet will give the Emory community a preview of its planned Musikverein program at a concert at the Schwartz Center for the Performing Arts on Friday, Nov. 6. Tickets are not required for this free performance. Ransom will be there in Vienna. "And we are inviting anyone who is interested to make the trip," he says. "We have a travel agent who will put packages together including concert tickets, airfare, hotel and more for those who are interested."